Reading author Amish Tripathi‘s book is a unique experience. Of course, nothing is perfect in the world and there are some aspects of his writing which are loved by the majority of readers while some stuff may not bee that appealing. In addition to being a fantastic writer he is even better at marketing, rather call him a genius marketing expert. He undoubted created or better we can say, made popular, a new genre in Indian literature, “mythology retold” The genre got so popular and here are some books which we can say fall in this genre. Amish’s journey as an author started with Shiva Trilogy and the 3 books in this series got critical and commercial acclaim. He was probably the first one who came up with an idea of having book trailers, which is then followed by almost every remarkable publishing house/author. This time Amish came up with two new marketing ideas for his books. Making a chapter or two available to read for free (mostly on Kindle). The second point can let readers read a part of the book and have a good idea of the content quality of the same. 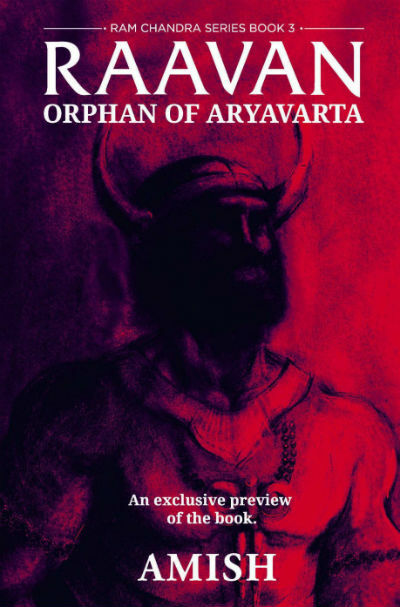 Adding to the same he gave away free reading teasers for his next book Raavan: Orphan of Aryavarta. He gave it away for first few pre-booking orders (even for paperback editions) and later he made it freely available for every one (Kindle edition). So, let us try to explore the free content. A right mixture of dark colors matching the personality of Raavan makes the cover page intriguing. Raavan, despite all his shortcomings, was a brave warrior, fantastic administrator, and an intelligent scholar. So the book title in white color (though it is to make it stand out in the dark background) is quite justifying as well. The preview content of the book also contains information about hyperlink book writing style and how it is planned. We’ve talked about it when reviewed the free content of second installment of the series, Sita: Warrior Of Mithila. Somewhere in the ancient India, Raavan, accompanied by his brother Kumbhkarn inside his marvelous vehicle. Famous as Pushpak Vimana, it was a vehicle which Raavan forcefully captured from Kuber, his half brother. The Pushpak Vimaan was one of its kind and there were legends about it spread across Aryavart and beyond. The vehicle is glorious, but rather than providing comfort and luxury, it was designed with a vision to provide strong means of communication. It can even transfer a small part of Raavan’s army at the desired destination. Of course, Rudraksh and other references to Lord Shiva, the supreme power Raavan used to bow in front of, are found in this rather rough and tough vehicle. As of now, the vehicle was on a trip and carrying a passenger which was remarkable in all senses. She is not conscious though. So, definitely she was not willing to board the flight. You can guess who she is and why she is on this flight :). While it is tough to judge a book from its cover and a movie from its trailer, a chapter from a book can give you good idea about the writing quality and style to expect from the final version. Being a brilliant marketer, Amish, took utmost care to let readers took a glance to the content of the book and yet not revealing anything about it. Being the first chapter of the book, it reiterate the incidents mentioned in the first two books of the series, of course, from different perspective. Amish is good at building scenes and explaining surroundings, and, he proves his metal again in this chapter as well. The description of the Pushpak Viman is something you will like to read. Why does the soul insist on hanging on to the body till the absolute last minute? Even when death is clearly the better alternative? Thick blood was pooling sluggishly under and around the soldier’s body. Soaking into the wet mud and discolouring the green grass. Every family has some idiots, Dada. You can clearly see the infusion of modernity and Indian-ness in the language. As it is available for free, it is full value for money :). Overall a nice chapter which is not revealing something new for the next book in Ram Chandra Series (which will release later this year, as per the schedule) yet draw interest of the reader towards it.